As Director of Tufts Wildlife Clinic, Flo Tseng oversees clinic operations and instructs students during their rotations at the clinic. Before joining the Tufts Wildlife Clinic in 2000, she received her DVM from Cornell University in 1981, worked in small animal and exotic private practice and then completed an internship in wildlife medicine at the Wildlife Center of Virginia. After her internship, she was the Director of Veterinary Services at a large rehabilitation center near Seattle until 1996. At that time she became the Research Director and Staff Veterinarian for International Bird Rescue Research Center in Berkeley, California (IBRRC). IBRRC is internationally renowned for their expertise in treating wildlife suffering from the effects of oil spills. Flo’s expertise lies in seabird rehabilitation and the effects of petroleum on these species. She is one of the principal investigators of TuftsCCM's Seabird Initiative, which has established SEANET, a regional seabird population and mortality monitoring program. In addition, she has interests in the use of analgesics in wildlife species and the ecological factors contributing to wildlife morbidity and mortality. When she is not running around after students and wild animals, she is kept very busy by her daughter, Rosie! Maureen Murray is a 2003 graduate of Cummings School of Veterinary Medicine at Tufts University. 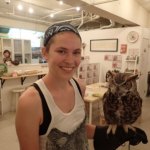 She is currently doing research on rodenticide poisoning in birds of prey at the Clinic. She also has a strong interest in turtle medicine and conservation and avian orthopedics. Dr. Michael Avery grew up in Cortland, New York, and attended Cornell University as an undergraduate in biology. After graduating, he worked in ecological research, first with northern flying squirrels and then Japanese giant salamanders before beginning graduate research in invertebrate ecology and climate change at Penn State University. 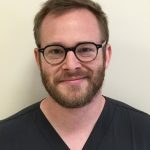 Hoping to combine his love of wildlife and interest in medicine, he began veterinary school at Cummings School of Veterinary medicine at Tufts University, graduating in 2018. Outside of the wildlife hospital, Dr. Avery loves to cook, eat, and, carve wood. Dr. Ashley Kramer was born and raised in southern California. She received her B.A. in Biological Sciences from Earlham College in 2011. Before starting veterinary school, she worked as a technician at a small animal clinic and volunteered at an equine practice. She graduated from the Cummings School of Veterinary Medicine at Tufts University in 2017. While in veterinary school she worked on the Large Animal Tech Team and was the president of the Avian Club and the wildlife coordinator for the Wildlife, Aquatic, Zoo and Exotic (WAZE) Club. She has worked in many wildlife centers around the United States and abroad in her time before, during, and after veterinary school. After graduating from veterinary school, she spent a year in Albuquerque, New Mexico completing a small animal rotating internship at VCA Veterinary Care and Referral Hospital. Her experience in small animal has helped her become a better and more skilled doctor but her true passion is wildlife medicine. She especially enjoys working with birds. Her long-term goal is to become a Diplomate of the American Board of Veterinary Practitioners specializing in avian medicine. While Dr. Kramer is not at work, she enjoys drawing, cooking, rock climbing and horseback riding. She also has a menagerie of rescue animals at home to keep her busy including 1 dog, 2 cats, 2 pigeons, 2 rabbits, 3 chickens, and 7 snakes. Paula McCarthy has been at Tufts Wildlife Clinic since 2004, first as a volunteer and then as a veterinary technician. She received her B.S. degree from the University of Minnesota in 1982 and obtained an Associates Degree in veterinary technology from the Medical Institute of Minnesota in 1985. She has a special interest in birds, especially raptors, and is fond of turtles. When not at Tufts Wildlife Clinic, Paula assists with the management of her husband's surgery practice, Veterinary Surgery of Central Mass, acts as a part-time taxi driver for her daughter Sara, keeps her son Nick in line, and spends as much time playing tennis as possible. 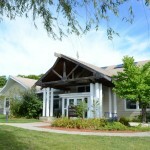 Whitney started working at Tufts Wildlife Clinic during the summer of 2011. She ensures that the clinic runs smoothly from assisting the faculty and students, recruiting volunteers, ordering supplies, or greeting you at the front desk. You can find her doing whatever is needed. Whitney earned her B.A. from Syracuse University as an art history and pre-veterinary medicine major. She has worked in the education and wildlife field for 15 years. During that time, Whitney worked as a high school biology teacher, worked in Yellowstone National Park researching bison, wolves, and grizzly bears, as well as in New Mexico researching prairie dog behavior. Whitney also traveled to South Africa where she assisted in the study of Brown Hyena behavior. Previously, she has worked for the Massachusetts Audubon Society where she was the Wildlife Supervisor and as a veterinary assistant gaining valuable medical experience for her future wildlife rehabilitation goals. Whitney has a soft spot for rodents, crows and vultures. 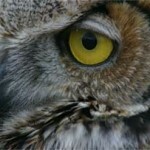 When Whitney is not at Tufts Wildlife Clinic, you can find her photographing wildlife or drawing. Percy arrived at the Clinic in 2003 as a juvenile with a severely injured eye. Unfortunately Percy lost his vision in his injured eye. Also, because Percy arrived at the clinic so young, he had never learned to hunt. Percy cannot be released or kept as a pet, so he has become a permanent member of the clinic helping teach veterinary students and acting as the Tufts Wildlife Clinic mascot. He enjoys perching on shoulders and heads, crickets and quiet times in the clinic with his friends.